Clonakilty is Ireland’s First Autism-Friendly town. In order to be designated Clonakilty went through a robust accreditation process. It had to engage and train 25% of businesses and voluntary organisations, train 50% of public services, 50% of school communities, 50% of healthcare professionals, 3 employers and reach and engage 25% of the town’s population as well as develop a three-year Autism Friendly town plan. To date, 212 organisations have been accredited with more organisations in the process of also being designated Autism Friendly Champions, including Ballynoe House. The high proportion of businesses in the town (more than 90) that are involved makes Clonakilty one of the most autism-friendly places in the World. What Makes Clonakilty Autism Friendly? 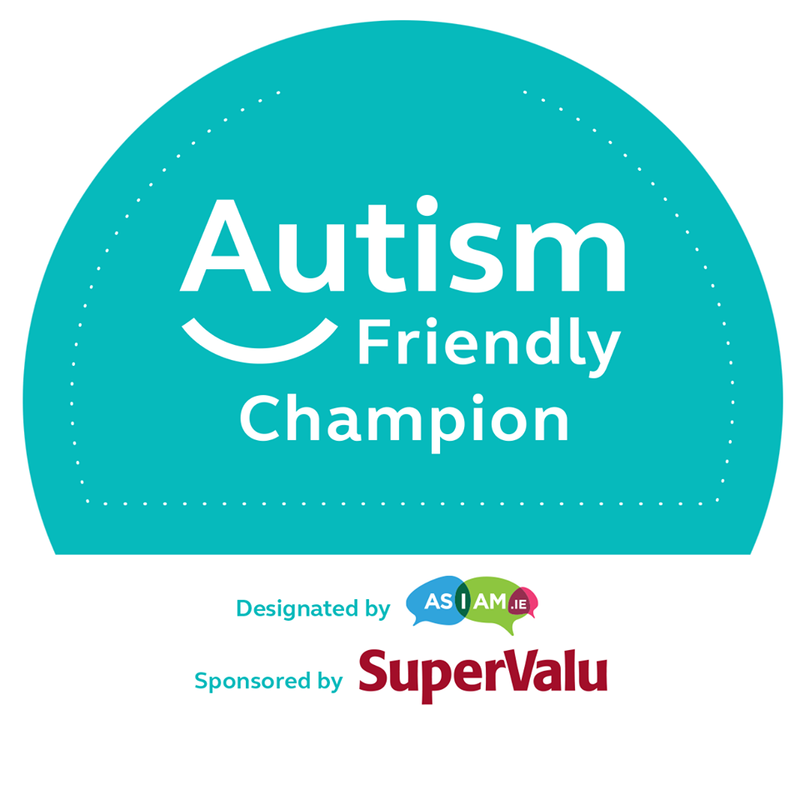 Autism Friendly organisations in Clonakilty are accredited “Autism Friendly Champions”. These organisations will display a sticker on the entrance of their premises to sign post they are champions. They will also display the Service Dog Friendly sticker to signal that they welcome service dogs on their premises. • Committed to working with the Clonakilty Autism Friendly Town Committee on the implementation of the three-year town plan. Ballynoe House is situated in quiet rural and coastal area that provides an immediately relaxing atmosphere. Our accommodation, while modern, is simple and practically-designed so that it can be modified quickly to meet your needs. The internal environment is gentle and uncluttered. All rooms have a high-degree of soundproofing, so almost every room can become a quiet and secure space. If you are an autistic adult, you are invited to contact us as part of the reservation process to discuss how we can making your stay more comfortable. We appreciate that it can be difficult finding suitable holiday accommodation for autistic children. Parents are invited to engage with us on how best the accommodation can be prepared to provide a better environment for their children as well as prepare for their holiday by browsing the autistic-friendliness of all the attractions and businesses in the Clonakilty area. As owners of Ballynoe House, we are completing our autism awareness training and audit to be registered as an Autism Champion. During 2019 we will also be making a video so that autistic guests can orientate themselves ahead of their visit. If you have any questions, please contact us.